The Houston Chronicle today (March 4, 2015) reported on a press conference in Austin at which Lt. Gov. Dan Patrick and Sen. Larry Taylor, R-Friendswood, discussed several education bills that are high on their priority list. A major thrust of the bills is to shorten the time before which a so-called failing school can be closed and potentially converted to a charter school. There are at least two significant problems with this approach. First, the major factor determining the degree of success of schools and school districts is the proportion of students who qualify for the free- or reduced-price lunch program, those who are economically disadvantaged. Second, there is no reason to believe that charter schools will do a better job of educating such students. Three figures are included below that show the math pass rates in 2013 for school districts and charter schools in Educational Service Center Region IV, much of which is in Sen. Taylor’s Senatorial district. The math pass rates for the schools and school districts are plotted on the vertical axis of each diagram, and the percentage of economically disadvantaged students on the horizontal axis. In Figure 1 the public school districts are highlighted in blue, the charter schools in red. 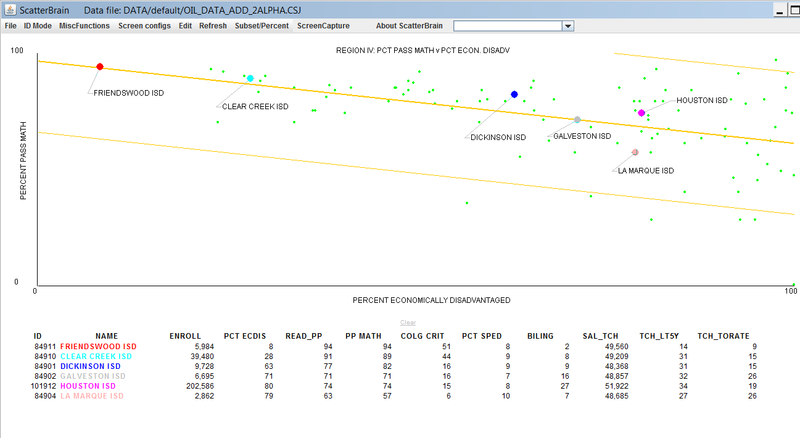 First, notice the downward slope to the middle line that is plotted through the points. This is the “best fit” or regression line that shows that on average as the percentage of economically disadvantaged students increase, test scores decrease. The second thing to note about Figure 1 is that all of the really low-scoring districts or charters are charter schools. The two lines on either side of the middle or regression line are two standard errors of the estimate (SEE) above and below the regression line. It is very unlikely that those schools that lie below the lower SEE do so because of chance occurrences. Math pass rates are percent at phase-in 1 level II or above. 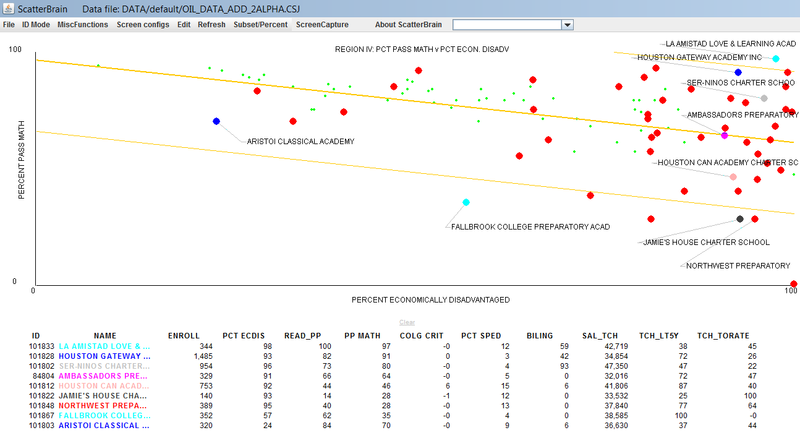 Figure 2 highlights some of the public school districts, with certain data for them displayed below the diagram. Economically Disadvantaged Students and Math Pass Rates. The relationship between pass rates and rates of economically disadvantaged students is clearly visible, from the diagram as well as from the data. Several individual charter schools are highlighted in Figure 3. (red dots) and Very Low Performance by Many of Them. Sen. Taylor’s hometown district—Friendswood ISD—is clearly one of the highest performing in Region IV. It also has the lowest percent of economically disadvantaged students among all of the school districts in the region. The math pass rate in Friendswood ISD is 23 points higher than in Galveston ISD. But the percentage of economically disadvantaged students in Galveston ISD is 63 percentage points higher then in Friendswood ISD. If Friendswood ISD and Galveston ISD swapped administrators and teachers it is unlikely that the academic performance in either district would be materially affected. If all of the charter schools were performing at a high level, then the case for closing so-called low-performing public schools and sending the students to charter schools would be much stronger. But that is not the case. Admittedly, some charter schools appear to be doing an outstanding job. But many are not. It is not enough for the State to merely test students and publish the results and expect miracles to happen. The national No Child Left Behind program has certainly demonstrated that. We are well beyond the point at which all students in all states were expected to be “at grade level” under that program. It is not being argued that nothing can be done to break the relationship between poverty and school performance. But by not addressing the very severe educational problems that face students who grow up in conditions of economic and cultural deprivation the problem will not be solved. The final point to be made here is that if improvements in Texas’ educational system were the top priority of officials and legislators in Texas, there would be much less talk about how to give another round of property tax relief. The usual reply is that money in education doesn’t really matter all that much. It may be true that school districts such as Friendswood ISD do not spend any more per pupil than does Galveston ISD. But neither do the students in Friendswood have the educational obstacles to overcome as do the students in Galveston, or La Marque. And if money makes no difference, why do rich families pay so much to send their children to exclusive private schools? Perhaps the amount spent by affluent families to send their children to private schools should be the standard for the state-funded public schools. La Marque ISD is on the verge of being taken over by the State and its students distributed among the surrounding districts. La Marque is highlighted in Figure 2. In Figure 3 there are at least nine charter schools highlighted whose math pass rates fall below that of La Marque ISD. Could the La Marque students be transferred to any of those? * Larry Toenjes can be reached at ltoenjes@aol.com.